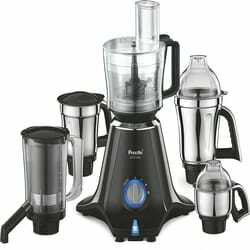 Hey Guy’s, Looking for the best food processor in India? Here we list down some great food processors with its reviews. 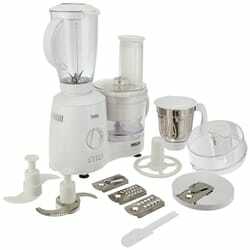 If you want to grind, mixing or juicing food processor is perfect appliances for your kitchen. The food processor provides three in one service. It works like charm hours of works in minutes. The special thing of the food processor is they also come with juicing facility so you don’t need to buy juicer separately. We list down best food processor in india based on expermint and reviews. So choose any from our list which is in your budget range. We guaranty it will best food processor in all over india. 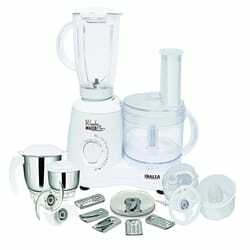 Inalsa Fiesta 650 watt is one of the best with cover highest review food processors in India. It comes with smart processor just for you. 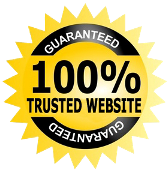 Most of the people trust on Inalsa product which will operating voltage of 220-240 volts. It works on a powerful motor of 650 watts which can break, grind, chop vegetables and mix each ingredient easily that making it one of the most powerful food processors. The blade made of stainless steel does not need to replace at least 5 years. Additionally, It comes with a 1.5-litre blender jar with a lid and a 1.0-litre stainless steel multipurpose grinding jar along with 4 segmented cutters for easy to chop. Its stainless steel jars make them extremely durable and sturdy. Has a 2 jar i.e blending and grinding. The offers a warranty of two years Manufacturer on the product and five years on the motor. Makes little noise while functioning. The name of the processor Preethi Zodiac is the leading food processor extremely useful for the juicing and grinding. It grinds hard item like turmeric in just 2 minutes. It has very powerful performance along with 750 watts powerful motor. 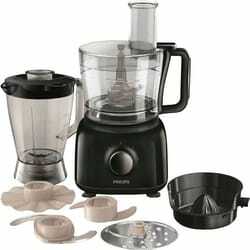 Preethi Zodiac food processor has master chef jars which making or kneading Atta can be done in 1 minutes. This multi-tasking food processor making it possible to grind, mix and chop all at one such device. The liquidizing jar has a capacity of 1.5 litres and grinding jar 1.0 L.
The elegant and graceful design which add sophistication to your kitchen. Have a 3-in-1 Insta fresh juicer jar. Its master chef jars kneading Atta and chop vegetables in minutes. 3-speed control knob you can set as per your requirement. Stainless steel jars & blades. Vega w5 motor for better work. The product is noise while it working. This handy kitchen appliance unquestionably works extraordinarily. Bajaj is a very long-standing brand and it presents such a best electronic devices. It uses 600 watts of the motor to perform in a great way. The appliance is made of an unbreakable polycarbonate processing jar with stainless steel blade for better sufferance. This jars including 1.5 litres of a liquidizing jar, 1 litre of grinding jar and 0.3 litres of chutney jar. Bajaj offers inbuilt jar locking mechanism for provided safety to the user. It can work with a various kind of purposes like kneading, whipping, coconut scraping, chopping, shredding and making finger chips. It designed with a motor overload protector function. It has a 600W motor with 30 minutes rating. Motor overload protector that helps in overload situations. Stainless Steel & Polycarbonate Jars for longevity. The built-in interlocking system that prevents injuries and accidents. It uses a low power motor of 600 watts. Philips has a distinguished brand in the world of electrical items. The using smarter food processor PowerChop Technology which provides fast and neatly chopping of vegetables or fruits just in minutes. Also, that enables you to prepare purees and mix smooth batters easily. It feeding tube 40% larger compared to other brand processors which helps you to insert large fruit and vegetables without a cut that save your time. It comes with 1.5-litre bowl capacity and 1-litre jar capacity. Additionally it dishwasher safe product for easy to cleaning. It is a made of good quality plastic. Powerful motor that uses just 650 watts of power. Power Chop technology for wondrous chopping. Emulsifying tool helps to whip the cream or beat the eggs properly. Cord length only 1 m.
Inalsa is one of the newest and best brands of best food processors in India. It uses 700 watts of the motor for better work efficiency. Which comes with 1 bowl and 3 attachments jar includes 1.5 L of a liquidizing jar, 1 L of grinding jar and 0.4 L chutney jar that help you to do multifunctional work. It comes with a warranty of 5 years on motor and 2 years on motors. If you have a little task that can perfect for medium size family. Centrifugal Juicer to provide fresh juices. 700 W power can continuously 30 mins perform. Overload protector features which automatically shut off when it becomes too hot. The unit is not easy to clean. Above we have given latest five best food processor information and reviews. But, our certain user till confused which one of the best and trending food processor in the Indian market. Those people must follow our personal opinion and be buying this product. 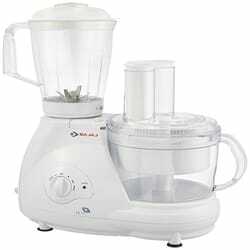 The food processor we suggest our customers i.e Inalsa Fiesta 650-Watt Food Processor. Because of this product comes with amazing features, design with beautiful white and grey colour. The Amazon highest review product with a reasonable price. With Food Processor, you can basically do anything like slicing, dicing, chopping, shredding, grating, mashing, grinding and tons of other things. You can also go with the combination of Food Processor and Blender. Why should you go with the combination? The first question which comes is whether you should buy a Food Processor alone or with a blender. Adding a blender will surely increase the size but you can do a lot with this combination. This type of food processors collects food as it’s processed. There is a central pillar to support the S blade or disc which cuts the food to the desired size. Bowl is detachable so that you can dispense food easily. As the name suggests, you can continuously supply food to the machine even though it is running. Good for those who want to produce large batches since this will consume less time. An amalgam of the bowl and continuous feed capabilities. You can use it as a bowling unit or use add-on so that it dispenses food externally. heavier and sturdier because of all metal design. you can chop anything from carrots to meat. What about the space occupied? As previously discussed, Food Processor alone would not occupy that much space. But, if you add the blender then no doubt the size and weight would increase. These bulky and heavy models can be permanently fixed right into your kitchen bench. So, look at your available space and then choose accordingly. Should I go with mini processors? Mini processor, as the name suggests, is the small and compact version of food processors. You should only go with this if you’re only going to use it occasionally. Since this is a mini version, large batches of preparation cannot be done with this. Also, you can not do slicing and grating in these models. Combine the mini processor with stick blenders to get the most out of the model. Let me tell you one thing in advance. Food Processors are going to be noisy and it’s normal don’t panic. There are some models which don’t produce any noise but again they’re not a complete package and lacks various stuff. In the case of quiet models, you’ll still need to raise your voice while talking. Imagine hearing motorcycle eight meters away. That’s how loud your loudest model would be. Make sure your food processor has enough power to handle heavy tasks like kneading stiff doughs, chopping raw carrots, or shredding a hard cheese. Otherwise, you’ll end up with imperfect food or worse the burned-out motor. I’ll personally recommend you to go with at least 600 watts if you’re looking for full-size food processors. Just like in every other kitchen appliance, Size depends on the number of people you’re typically going to cook for. For a family of four, an 11-cup size should be enough. Another thing which directly depends on the size is the task. For the heavy preparations, you need a large machine. Most of the food processors come with the entire collection of accessories to enhance your experience and make everything easy for you. Other attachments that turn your food processor into a citrus juicer or a bread dough kneader. Before spending money, check what type of accessories it is coming with and which one you’re going to use in reality. Beater and whisk disc attachments: A must accessory if you want to whip creams or beat egg whites. Internal storage: Some food processors come with internal storage that lets you store all the accessories and attachments easily. This way your accessories such as blades remains protected. Although, there are some models which not large enough to provide internal storage options. Bowl size: For bowl size, think about the amount of food you’ll be dealing with on regular basis. If it is small then a small size bowl would be enough for you. Reversible blade: If your food processor is small in size, then the reversible blade is what you need. It acts as a slicing blade on one side and grating blade on the other. Double feed chute: If you want to guide smaller or thinner foods into the food processor, then double feed chute is a must-have feature for you. In this, there is a standard chute as well as a smaller chute. Chipping blade: Want to make chips or vegetable strips? you need chipping blade. Incher/Pulse mode: This feature will let you chop delicate food items like onions & hard boiled eggs or whipping milkshakes or folding flour into batter form. This feature should be must in your model because you never know when you need it. Rubber feet: With rubber feet, your machine will not tend to slip while running. Auto Turn Off: With this feature, your appliance will shut down automatically once the food processing is done. This not only saves electricity but also keeps the appliance safe from short circuit. Cool outer surface: Since the motor will be running at the high speed, the outer body of the machine will get hot unless the model has always cool surface. You can handle the appliance easily and saves you from severe burns. Locking Feature: Look for a food processor which has a locking feature that has this automated system of locking the jar tightly. The appliance will not start unless the jar is closed perfectly. This ensures safety on all grounds. Circuit Breaker: Overloading the food processor will result in the motor being burn out. A circuit breaker will prevent this from happening. This will increase the lifelong of the appliance as well as will keep your home safe.